WE’VE GOT THE POWER TO KEEP YOU GOING! 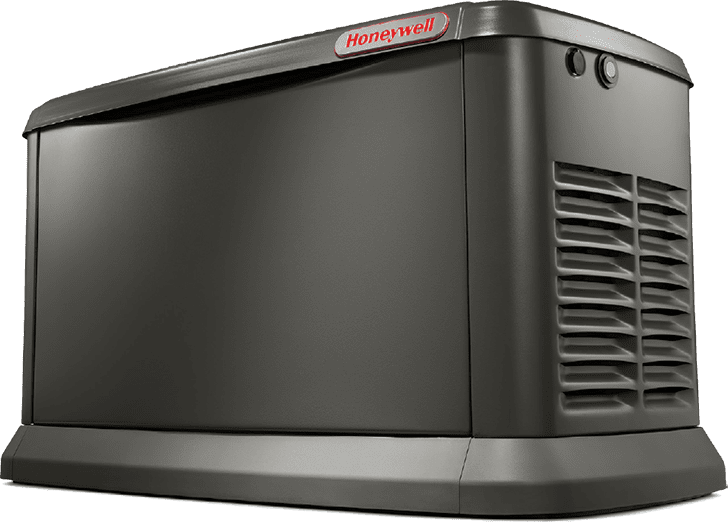 5-Year Warranty – Honeywell home backup generators carry a Premium 5 Year Limited Warranty. Engineered and Built in the USA – Honeywell Generators and engines are engineered and Built in the USA. Tough, Durable All-Aluminum Enclosures have a RhinoCoat™ powder-coated finish that helps make corrosion-resistant aluminum perfect for all weather conditions. Quiet-Test™ Self-Test mode runs at a lower RPM for a five- or twelve-minute test, making generators significantly quieter than other brands while consuming less fuel. Smart, User-Friendly Controls – Honeywell Generator’s SyncController allows users to monitor battery status and track maintenance intervals to ensure your generator is always in top operating condition. Mobile Link™ Remote Monitoring allows you to monitor the status of your generator from anywhere in the world using a smartphone, tablet, or PC. Housed in an aluminum NEMA/UL Type 3R enclosure with electrostatically applied and baked powder paint. The control at the generator handles all the timing, sensing, and exercising functions. 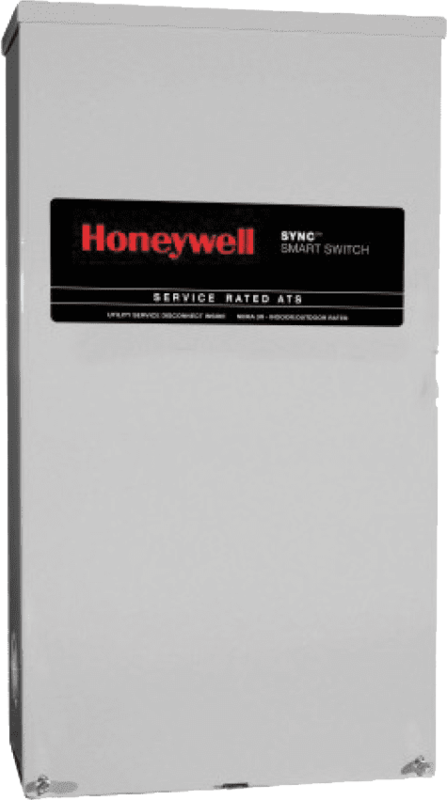 The Heavy Duty Honeywell Contactor is a UL recognized device, designed for years of service. DPM Technology -Through the use of digital power technology (DPM), each switch has the capability to manage up to four individual HVAC loads with no additional hardware. When used in tandem with Smart Management modules, up to eight more loads can be managed as well, providing the most installation-efficient power management options available. Every standby generator requires a battery to start the system. 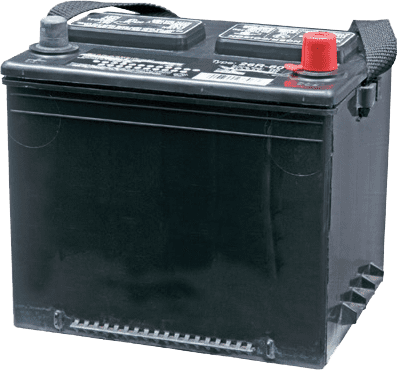 In efforts to achieve the easiest generator installation, we install the recommended 26R wet cell battery applicable for virtually all residential Honeywell standby generators. This battery will need to be replaced every 5 years. Honeywell’s Smart Power Management System is designed to optimize the performance of a standby generator. The system can consist of up to 8 individual Smart Management Modules (SMM). Unlike other load management systems that depend on another control device, the SMM modules are actually self-aware and operate autonomously. Frequency is the true measure of generator engine performance and does not need to factor in increased ambient temperatures, elevation changes or generator fuel type. 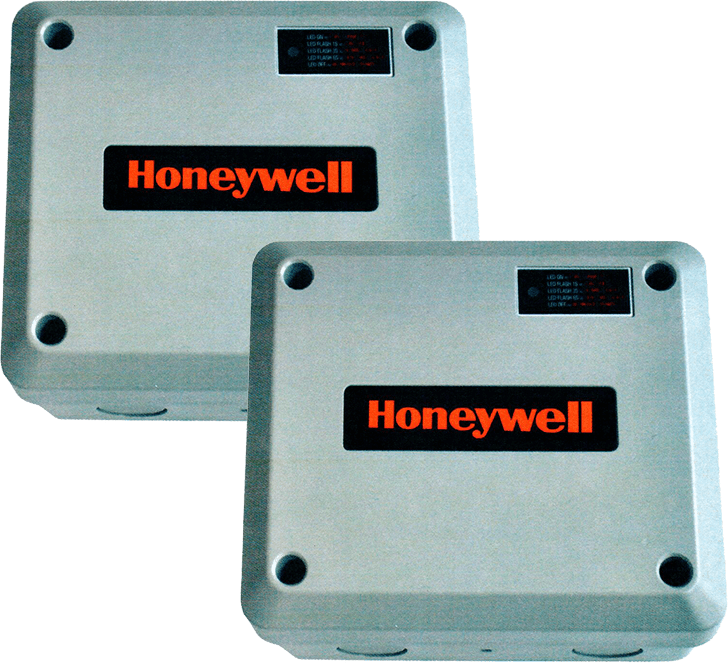 The modules monitor the frequency (Hz) of the power being produced by Honeywell’s standby generators and if it falls below a certain threshold, the module will automatically follow a power management algorithm to ensure that the generator is not overloaded. The modules can be set to a load priority between 1-8 or be set in a lock out only mode for loads that just simply do not need to run in an outage, therefore reducing the necessary size of the generator for a more cost effective solution. Severe storms are on the rise. Tornadoes, tropical storms and hurricanes can bring strong winds and cause flooding. These will damage power lines and result in widespread power outages. Freezing rain and ice will also cover trees and powerlines causing them to collapse. Backup power is one way to be ready for these storms. Preparing for severe weather early is the key to keeping you and your loved ones safe and comfortable while you ride out a storm. Maybe it’s a storm or utility equipment failure. In any case, the electricity you’re dependent on is suddenly gone. Within seconds, your generator starts up, preparing to restore your home’s power. The automatic transfer switch sends generator power to your home and will continue providing power until your main power source returns, whether that’s for two hours or two weeks. Your generator system detects when utility power is returned and restores power to your home. The system then returns the generator to standby mode waiting for the next loss of power. 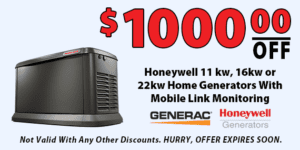 Honeywell home backup generators are the most cost effective on the market. Installation costs vary by system size, installation considerations and local building codes. The lowest installation cost can be obtained when the electric meter and gas meter are located on the same side of the home. Costs will increase if the generator and meters are located further apart. 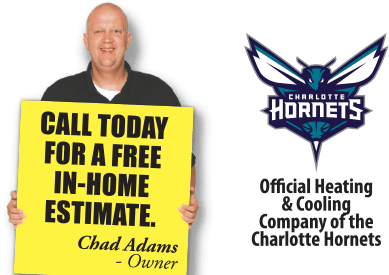 We offer a free in home consultation to size a unit that will meet your needs.